With insight, skill, and experience, Estate Planning Attorney Sheila Barton can help you leave a secure, lasting legacy while achieving your financial goals and simplifying the legal process for your family in the future. You will gain peace of mind now from knowing your wishes will be fulfilled after you are gone or when you are no longer able to manage your affairs. Estate Planning Lawyer Sheila J. Barton combines compassion and integrity with knowledge and common sense in order to create effective legal solutions for clients in Cathedral City and throughout Southern California. She brings a personal approach to each matter and is dedicated to determining the best strategies for meeting the unique estate objectives of each client and their beneficiaries. With over 30 years of experience, Estate Planning Attorney Barton is prepared to handle your legal issues and help you create a solid estate plan. She will thoroughly explain the process, including options which allow for managing your assets during your lifetime and after your death. Ms. Barton works diligently to maximize your lifetime of accomplishments while minimizing tax liabilities and contentious estate issues. As an experienced estate planning lawyer, Ms. Barton provides knowledgeable legal advice and counsel throughout the entire estate planning process. She offers skilled guidance as you make thoughtful decisions about your future in order to ensure a smooth transition of your assets to your heirs in the event of incapacity or death. 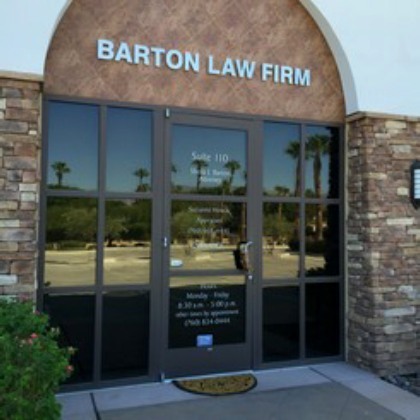 In addition to handling estate-related matters, Cathedral City Attorney Sheila Barton is an experienced Employment Attorney who represents employees in workplace disputes against their employer. At the Barton Law Firm, we believe the process for planning and organizing your estate involves much more than filling out forms with legal information. Estate Planning Lawyer Sheila Barton will design your estate plan to reflect your wishes, values and personal relationships while addressing your concerns. She will help you take an active approach toward optimizing the protection of your assets while preserving your family’s wealth, and making plans for future healthcare and financial management. Call Estate Planning Lawyer Sheila Barton and learn how we can help you achieve peace of mind today by carefully planning for your future.